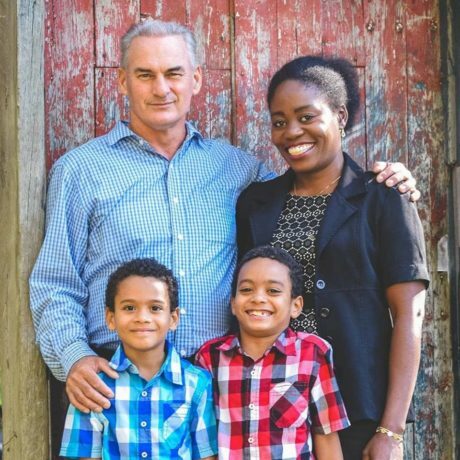 Missionary Tony Jones, with his wife Edna and sons Caleb (left) and Ben, has volunteered for a decade in Haiti and calls his John Deere Gator the main tool for his work. Given the towing capacity, maneuverability, and compact convenience of the John Deere Gator™, it’s easy for customers to consider it a tool they can’t live without. 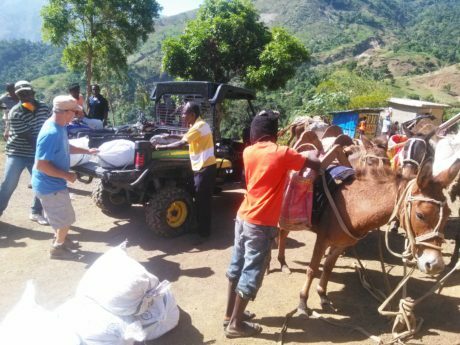 But for Ontario, Canada native Tony Jones, who’s volunteering long-term in the mountains of Haiti, keeping his Gator XUV 855D running strong really is a matter of life and death. For more than a decade, Jones has devoted his life to serving the desperately impoverished people of Haiti — which ranks as the poorest country in the Western Hemisphere. Far more than a job, the missionary work he does is a selfless calling. Jones gave up everything nearly 20 years ago to help those with next to nothing: his log cabin construction business, his land, his tools, and equipment. Everything. After a challenging, yet rewarding mission in Cuba, Jones settled in Grand Goav, Haiti, home to several missions, yet none serving those with the most needs of all: Haiti’s mountain population. Haiti is 80% mountainous with little more than trails for traveling. In the early days, he would make his way up the mountain on motorcycle as far as he could go and then ride on a donkey the rest of the way up the steep inclines—a treacherous journey that took hours. Rather than ask for money to help the poor, Jones wanted to help the Haitian people help themselves. So, he started buying the coffee they grew, bringing it to town, and selling it to local missions. Impressed with his commitment, one volunteer worked with a church in Eau Claire, Wisconsin in 2012, to buy a Gator XUV855D for him. With Jones at the wheel, the Gator has transported at least 15 women in labor – some with life-threatening conditions – to area hospitals. What was once a 12-hour trek to the hospital now takes half that time thanks to the power of the Gator. When someone dies in hospital, it is very difficult to move the body back up to the mountain for burial. Jones has helped some of the families of deceased villagers by transporting their loved ones’ bodies to their final resting place. 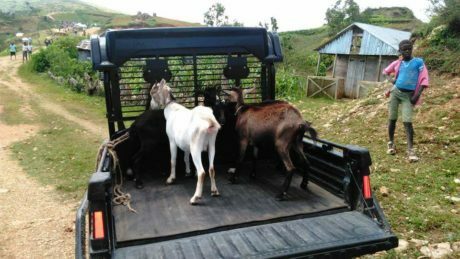 With the help of the Gator, Jones has dramatically expanded the transport of coffee on behalf of the growers and increased their income. Following the devasting hurricane of 2016, he used the Gator to deliver 10,000 coffee plants to help the farmers restart their crop, transporting 750 plants at a time on the Gator. Once harvested, he brings the coffee to Port Au Prince, roasts it, and ships it the U.S. for sale. During the cholera outbreak that struck Haiti after the ravaging earthquake of 2010, Jones transported medicine up and people down to the hospital. He also used the Gator to deliver at least 10 tons of food following the 2016 hurricane. 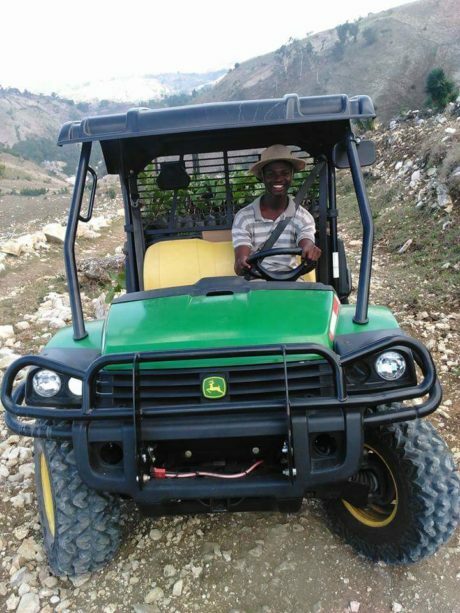 With no Ag & Turf John Deere dealer on the island, Jones relies on his mechanical skills and delivery of needed parts brought by volunteers coming to Haiti – volunteers like Cody Custer, Crop Harvesting Customer Support Planning Specialist. Custer recently returned to Haiti with his wife and two of his daughters along with service parts for him. Tony also relies on JohnDeere.com to help him service the Gator. This 855D Gator travels up the rugged trails of Haiti’s mountains to deliver food, medicine, and other needed supplies to villagers. “The XUV 855D Crossover Series Utility Vehicles are designed for operators who require a vehicle that can take on heavy-duty jobs and conquer even the roughest terrain,” said Jordan Carey, Product Support representative at Horicon Works, where the John Deere Gators are built.